Are you experiencing heel pain and keep hearing your podiatrist tell you about ESWT Treatment? So what is ESWT Treatment? Extracorporeal mean outside the body and this is exactly where the therapy is applied. 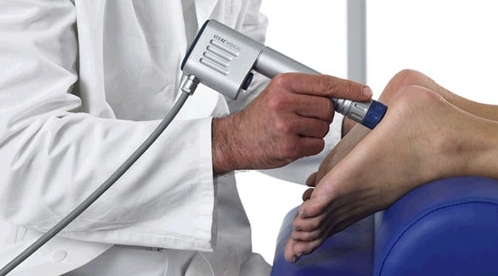 Extracorporeal Shock Wave Therapy is a noninvasive treatment that uses sound waves to increase blood flow and metabolic activity, accelerating the body’s own natural healing process. The ESWT treatment is most commonly used for plantar fasciitis, which is also known as heel pain. Shockwaves are applied via hand piece and held against the skin. In the initial phase of the treatment it may cause some pain, however, this indicates correct targeting of the problem area. The treatment sessions are 7 minutes, and you may receive up to 5,000 pulses. Many patients receive pain relief in just 8-10 days after the first treatment. This ESWT treatment can eliminate heel pain in as few as 6 treatments. Although, depending on your condition you may require 6 to 10 treatments, the average is 6. You may feel some soreness, which may intensify on the night of the treatment. You may simply take Tylenol to help the pain. There may also be some minor bruising in the treatment area. You should rest and avoid aggravating activities for 2-3 days after the treatment. An office visit will be billed to your insurance. A gentle nerve block will also be performed. (In our office the ESWT is performed of low frequency. The nerve block injection allows for the shock waves to be increased, allowing for a better healing. Without this injection the shock waves can’t be increased to a level that allows maximum healing. The nerve block injection is NECESSARY for insurance companies to pay for the ESWT. If you decide not to have the nerve block injection, the cost is only $65.00 per treatment. If you have concerns and are questioning on what option to choose you can discuss this with our Medical Assistant or Physician. To learn more about the ESWT Treatment check out our video or if you have any questions please don’t hesitate to give us a call 1-888-506-6652!